Reliable, high-speed data transmission isn’t an option any more. And, with more data than ever before, industrial networks need to keep up with evolving bandwidth requirements. With the influx of data from smart machines, the once compartmentalized worlds of IT and OT need to follow similar standards to operate more efficiently and achieve these requirements. Due to this inevitable convergence of IT and OT and the greater demand for seamless communication across many connected devices, networks will require an increasing amount of bandwidth. Our conclusion? Full gigabit networks are the standard of the future. Right now, single Gigabit and 2.5 Gigabit speeds are needed, but we know 10 Gigabit speeds are right around the corner. While current and future data transmission speeds will impact many sectors, we’ll use the automotive industry as a prime example to illustrate the degree of change that must take place when upgrading your automation network. Between the growing use of Ethernet-based technologies and more Ethernet-connected devices, the integration of all components into the network structure is important. Production and company networks must be seamlessly integrated under the same IT standards and communication technologies. This alignment is what forms the foundation for digitizing your production processes. Wireless communication standards also play a central role in leveraging the potential of this integration. To handle these increasing complexities, modern networks are divided into logical segments (or layers) that are oriented to specific production processes. This makes them more manageable. The Hierarchical internetworking model is a three-layer model for network design that divides networks into three layers: core, distribution and access. And while IT typically only “owned” the Enterprise network, they have increasing influence down into the network layers typically “owned” by OT. For the purposes of this blog (and because of my background in automotive manufacturing), we’ll use the example of an automotive plant. Understanding how the three network layers are related and how they must communicate with one another within the network will illustrate just how important full gigabit networking has become. Depending on which network layers you have ownership of or influence on, you can jump down to that relevant section to read about what challenges or trends should top your priority list in the next few years. The Core network provides high-speed, highly redundant forwarding services. It moves packets between devices in the Distribution layer to different regions of the network. The devices used in the Core layer, such as switches and routers, are usually the most powerful and manage the highest-speed connections. The Core layer is focused on the fastest and most reliable transmission of data packets and connects the production network to the company network. There is currently a large variety of data being distributed over the communication network. Examples include work assignments to machines, software updates, video data from vision systems and much more. At this level of communication, the throughput is very high and will only continue to rise as factories grow and add components to the network. With a greater throughput, the bandwidth requirement for switches at the Core level is increasing to 10 Gbit/s and beyond. However, the jump to a 10 Gbit/s network is a serious commitment. There are more conservative options when upgrading, such as implementing the new 2.5 Gbit/s standard as per IEEE 802.3bz. This smaller transition still enables higher data transmission rates without having to make new investments. This upgrade acts as an intermediate stage of wired Ethernet bandwidth expansion on the path to someday upgrading to a full gigabit network. Whether updating incrementally or making the leap to full gigabit speeds, both options are an improvement upon current standards in wireless connectivity. Wireless commonly relies on transfers over a 1 Gbit/s bandwidth, which places serious constraints on the network. In an automotive plant, the size and bandwidth of the network are definitive factors when considering these protocols and mechanisms. Network speeds and availability must rise to meet these increasing demands for efficiency. 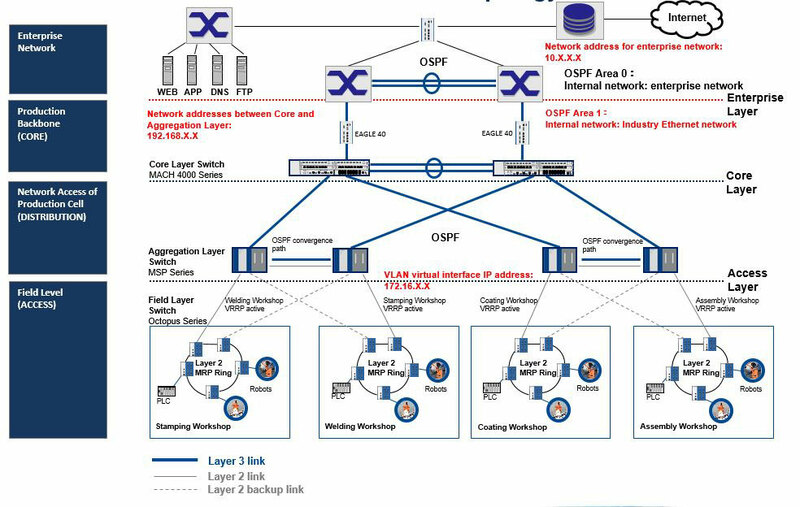 Here, the application of IT standards, such as the dynamic routing protocol OSPF (Open-Shortest-Path-First) is beneficial, particularly due to better scalability. Other IT standards, such as MPLS (Multiprotocol Label Switching), offer a bandwidth reservation for various services. The high availability offered by the Time-Sensitive Networking (TSN) standard will also be increasingly used in production in the future. To connect programmable logic controllers (PLCs) to the local cloud, information will need to be transferred in real-time from the Access (field) level to the Core (backbone). One way to enable the transfer of data with hard real-time requirements and include background data is through TSN technology, which is fully compatible with current Ethernet networking. When data isn’t transferred this way, however, interferences are likely to happen. The backing of the TSN standard is demonstrated, among other things, by the entry of many significant automation companies into the TSN Task Group (IEEE 802.1), including Belden. The Distribution layer is the “smart” layer within the model. This is where data is filtered and routed. Quality of Service (QoS) policies are also managed here, in addition to individual WAN connections. This level of the network connects each production cell to machines in the field. 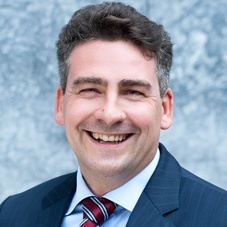 The Distribution level faces significant technological changes due to the virtualization of application controls – a process brought on by the adoption of new Industrie 4.0 standards. Bandwidth requirements continue to increase substantially in this level. These requirements are being driven by the same factors mentioned above in the Core segment. Today, we still see many 1 Gigabit networks, but 10 Gigabits is becoming the standard on the production floor. Production cell connectivity requires segmentation for several reasons. First, segmentation helps limit the effects of network errors, failures and cyberattacks. Second, segmenting into a manageable number of automation participants offers more flexibility for machines. Segmentation takes place in Layer 2 through virtual local area networks (VLANs). As the number of IP devices grows within this segment, the number of VLANs to connect the devices grows too. However, this can lead to broadcast storms or other network flooding problems. To solve this, routing to Access layers drastically reduces the impact of the failure by using all connections and creating a customizable, dynamic network environment. Security is also increased through the use of firewalls with access restrictions. They increase network security in the general routing network architecture. However, the use of a central firewall alone is not adequate. At the production cell level, a decentralized approach to security becomes more and more important. Proactive industrial security surveillance solutions, which detect anomalies in data traffic, help ensure greater security. This level of the network enables communication between field level machines and helps terminal devices within a production cell to connect with one another. Communication at this level significantly changes when the standards of the IIoT are implemented. The need for real-time communication continues to grow due to the increasing use of PROFINET and EtherNet/IP networks to control and network machines. What’s more, the interconnection of field devices to virtual controls must be calculated with a paradigm shift. The precondition for this is the use of real-time switches, which are based on new open standardization processes, such as TSN, and build on existing Ethernet communication protocols. With the increasing dissemination of Ethernet in the machines, terminal devices (such as I/O devices in every machine) have their own IP addresses. IP address bottlenecks can arise in the process of integrating these machines over the network access in the superordinate distribution network. With the use of NAT functionality in Layer 3 switches or routable firewalls, an individual adjustment of the IP address can be avoided because NAT translates these automatically. The advantage here is that the networks can be identically established and are then easier to use for automation technicians. In the production cells of the powertrain and body shop, the components are subjected to harsh conditions and rugged environments. From welding sparks to temperatures up to 700 degrees, cables and electronic parts can easily become damaged. In the powertrain area, oil and chemical resistance, as well as vibration and shock resistance, play a significant role. In the body shop, robots are even cleaned with dry ice! With the trend to optimize automation costs, drives move parts -- such as switches and I/O modules -- closer to the machine, which subsequently eliminates the control cabinet. Because of this, we see more use of components rated for IP65 protection degree or higher, as well as those with M12 connection technology. The use of automated guided vehicles, warehouse shuttles and automated fork lifts is an increasingly central component for material supply in automotive production plants – and these technologies will be an important component in future Industrie 4.0 initiatives. These vehicles allow for detached material flow away from the assembly line to the flexible production island. A high-availability wireless LAN connection that enables wide spatial coverage and interruption-free roaming is essential to fulfill these growing requirements. PRP, in combination with wireless LAN, offers interesting trend-setting solutions too. Many new emerging areas will rely on the application of wireless LAN. This could include condition monitoring for transferring video signals or monitoring press lines. In the next few years, we anticipate seeing more than 10,000 wireless interfaces in one single production plant! This will result in additional requirements with respect to scalability and bandwidth for the wireless technology used.